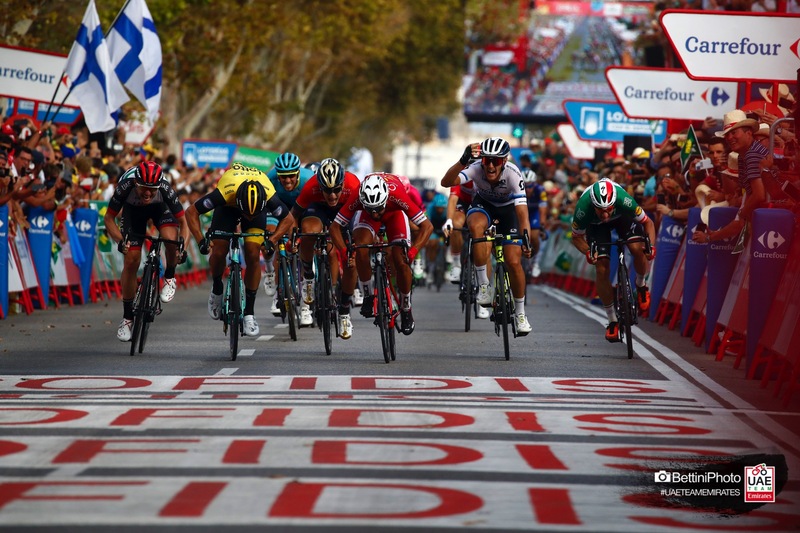 It was another hot and hard day in the saddle for UAE Team Emirates as they battled through stage 6 of this year’s Vuelta. The graft paid off with Simone Consonni building on his fifth place finish earlier in the week with an impressive fourth in today’s stage. The team’s leader, Fabio Aru, was also able to finish ahead of many of his GC rivals and climb another three spots in the GC standings to 13th place. The 150.7km route from Huercal Overa to San Javier Mar Menor was set up for the sprinters, with an early breakaway being gradually reeled in by the peloton and swallowed up with 28kms to go. A crash at the 25km mark split the pack and separated many of the UAE Team Emirates’ riders – who were all able to stay on their bikes and avoid injury. Thanks to the team’s ongoing efforts throughout the race Fabio Aru was kept safe at the front of the peloton and, along with Sven Erik Bystrøm and Simone Consonni, made the front group after the split. The leading riders pushed hard in the final kilometres to distance themselves from the chasers, but the UAE Team Emirates’ riders were more than equal to the ongoing accelerations. Consonni, the team’s sprinter, continued to work hard through a technical run in to the finish and drove his way past a string of rivals to take fourth place. The stage was eventually won by Nacer Bouhanni (Cofidis) in 3:58:35”. Commenting on his race, Consonni said: “I’m pretty satisfied because I succeeded in being in the lead group when the bunch was split, that was a great chance and I’m happy I could exploit it. Unfortunately I did not manage the approach to the final roundabout as well as I could have. I was not in the best position when Quick-Step Floors launched the sprint, but because it was pretty early, it allowed me to overtake some riders and get closer to a podium finish”. 2 Danny van Poppel (Ned) LottoNL-Jumbo s.t.